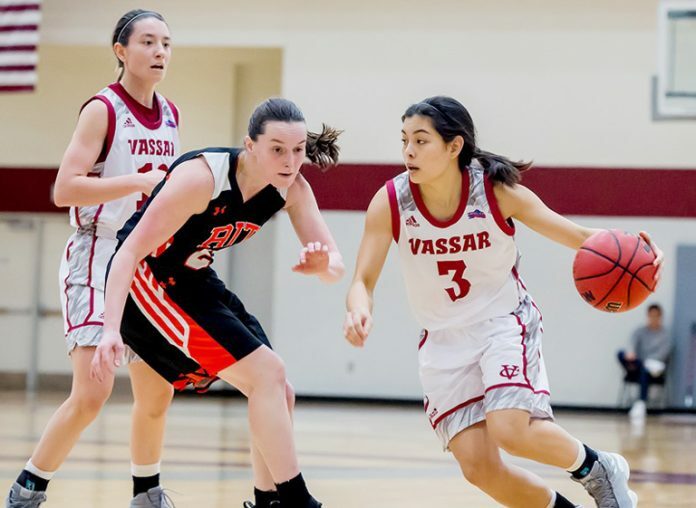 POUGHKEEPSIE – Four Brewers scored in double figures as the Vassar women’s basketball team cruised past Clarkson 77-48 on Saturday afternoon at the AFC. Vassar remains undefeated in 2019 with this being the 14th win in a row since Dec. 1. Junior Jackie Cenan led the Brewers (17-2, 11-1 Liberty) for the second-straight night with 14 points and added five boards and three steals. Sophie Nick (Denver, CO) tallied a double-double behind 13 points and 11 rebounds, while freshman Dani Douglas had 13 as well. After a slow start that saw the Golden Knights (6-11, 3-7 Liberty) outscore the Brewers 16-11 in the first quarter, Vassar exploded for 28 points in the second. A Clarkson layup at 9:45 put the Golden Knights up 18-11, but a pair of baskets from Skylar Schmid and Cenan pulled the game within three at 18-15. Clarkson’s Hannah Earl sank a layup, but Isa Peczuh drained a three immediately after to cut the lead to two. Nick tied the game 20-20, and then Cenan scored the next five Vassar points to take the lead for the rest of the afternoon. The Brewers led by as much as 14 in the second quarter while limiting Clarkson to only nine points. Vassar continued to roll in the second half. A few back-and-forth baskets put the game 45-31 at 5:32. Following a Clarkson triple, Nick made a jumper to spurt a 7-0 Brewers run. In that span Douglas sank a trey from a Ryan DeOrio feed and Schmid connected for a layup to make the score 52-31. Maddie Leong scored the last four Vassar points in the third. The first basket came off a Lexi Mousley pass on a fast break and the following from a Sarah Gillooly dish. Vassar led 56-33 heading into the final stanza, and went up by as much as 30. Clarkson would never pull within closer than 21 in the fourth. Gillooly scored a career-high eight points and added three rebounds and three assists. Leong finished with six points, four assists and six rebounds. The Brewers shot 55.4 percent (31-of-56) and held Clarkson to just 30.8 percent (20-of-65). Vassar outrebounded the Golden Knights 42-33. The Brewers now start a four-game road trip beginning with Bard on Fri. Feb 1. Game time is set for 5 p.m.